It’s only two days before Christmas. I know most people in the last forty-eight hours before the Yuletide would be focussing on last minute shopping for presents or foraging for the ingredients for their Christmas feasts, or making their last minute arrangements for their holiday celebrations. So now may not be the right time to post something meaty about the philosophy of free will, but hey, it might just make for a welcome distraction. Come with me, if you’re game, down the rabbit hole of our choices. Dr Leaf, communication pathologist and self-titled cognitive neuroscientist, posted a quote today from former Regius Professor of Divinity at the University of Oxford, Keith Ward: “Free will is a place where people can decide to do what is right or to do what is wrong and nothing determines their choice – lots of things influence their choice but nothing determines it except them”. But is it, really? Clearly Professor Ward is a very learned fellow, but what strikes me about Dr Leaf’s quote of the day is Professor Ward’s false moral dichotomy, and his over-simplistic implication that every choice is a fully conscious choice. Perhaps his quote is taken out of context by Dr Leaf and his intended message has been skewed. It wouldn’t be the first time Dr Leaf has cherry-picked and misquoted. 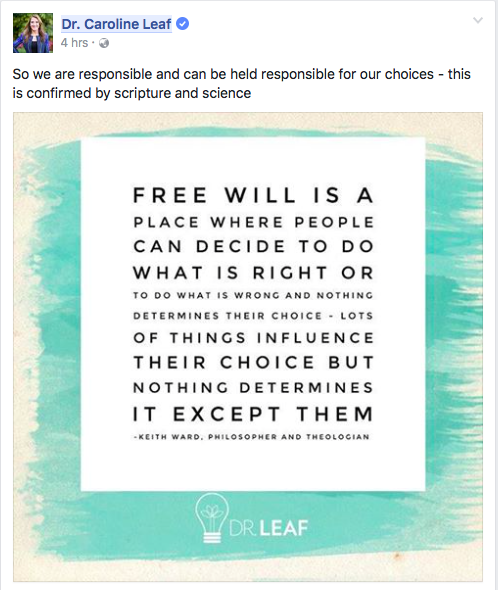 Dr Leaf added in her ‘me too’ comment – “So we are responsible and can be held responsible for our choices – this is confirmed by science and scripture”. I should say, it’s not that Dr Leaf’s comment is completely wrong – we are held responsible for our choices, but this isn’t confirmed by science or by scripture, it is something that is legal more than it is scientific or scriptural. As humans, we have a strong feeling of voluntary control over our actions, that everything we do is something that we choose to do. This sense of control is so fundamental to our existence that much of our social system depends on it, such as our laws and the penalties for breaking them . Except that science has proven that our sense of full control is largely an illusion. I understand this idea might be hard for some people to accept. We’re taught that we have full control over our actions or ideas. We experience this sense of control from the vantage point of our own perception. It’s hard to believe that we’re not really in full control of our actions and choices. The dominant paradigm in the Christian church is the idea of free will. We’re taught that the words we say and things we do are the exclusive product of our will. Cognitive neuroscience paints a different picture. The modern neuroscience of the will started with Benjamin Libet. Professor Libet was a researcher in physiology at the University of California San Francisco. He was initially studying the electrical properties of different sensations in the brain, but in the early 1980’s, he performed an experiment to look at the electrical readings that take place when a person decides on an action. His subjects would decide to perform a simple movement of their arm or hand, and say when they were aware of the intention to act. Electrodes connected to the subject’s heads measured their brain activity before, during, and after their decision to act. What was remarkable was that there was a clear spike in electrical activity occurring up to a full second before a test subject was consciously aware of the intention to act . Libet suggested that an unconscious process was responsible for the ‘willed’ action. Other studies since that time have confirmed Libet’s results. In fact, a study in 2008 showed that predictable brain activity occurred up to eight seconds before a person was aware of their intention to act . This predictable unconscious spike of brain activity prior to awareness of our intention to act has been verified over and over and is beyond doubt, but there’s still lots of debate as to exactly what it means. Defenders of the idea of free will have tried presenting alternative explanations of the pre-awareness unconscious activity, but none of them line up with the proven, repeatable science. So if we don’t have full conscious control of our actions, what does go on in our brains when we perform an action? Again, I won’t go into the fine print, but it’s important to understand that our brain does most of its work at a subconscious level, which includes the planning and execution of our actions [4, 5]. The brain takes the information presented to it, as well as information from memories, and makes a prediction of the best course of action. This means that our processing of goals, rewards, and actions can be affected by ‘subliminal priming’ (in other words, information we process below our conscious level can affect the decision about the best course of action ). Even though we’re not aware of every process the brain employs in our subconscious to formulate the best plan of action and to prime our system ready for that action, there is a element of awareness that provides real-time monitoring and a veto function . Like if you were about to complain about your job and then suddenly remembered you were talking to your boss, you could stop yourself from saying something you might later regret. What does it all mean? The take-away message here is this: We have limited will, not free will. We still have some capacity to choose, but our conscious choices are dependent on our subconscious brain activity, our experience and knowledge. We can make choices, or “exercise our will”, if you like, but within the constraints of a number of factors beyond our conscious control. We can “pull the brake”, so to speak, and stop an action that our subconscious brain activity primed us for, but wasn’t such a good idea when a bit more thought was applied. Our brain also uses our experience and knowledge to predict the best action to take, and because some of our knowledge and experience comes from exercising our limited choices, we can also say we have some input into our decisions. So in this sense, Prof Ward is correct – lots of things influence people’s choices and ultimately, the choice someone makes is their choice. I don’t make your choices for you, they are your choices. Except that it’s inaccurate and misleading to think of our will as being entirely conscious and thought driven. We make a lot of subconscious decisions every day, often based on subconscious priming. Most actions we take, day in and day out, are not influenced by our conscious thought. They may sometimes make it into our subconscious awareness, and if they do, it’s often after the fact. Have ever had a “Why did I say that” experiences, where your brain is thinking one thing and your mouth says another? These are times that demonstrate the difference in the systems at work in our brains, which are usually co-ordinated, but not always. There are other demonstrations of this as well, like specific brain pathologies leading to conditions such as Alien Hand Syndrome. These sort of conditions show that intention is not the same as action. Professor Ward’s quote also sets up a false dichotomy of free will into only right or only wrong, and doesn’t take into account the intellectual or developmental capacity of a person to make a choice. Would you expect a two-year-old to judge a complex moral life or death situation? A more practical example is should people with dementia be able to make their own financial and health-related decisions? Most reasonable people would say, “Well, that depends …” and that’s the correct answer here. Nothing in the real world of human morality and choice is black or white. There is always some subtlety, some nuance. When put in context, the black-and-white thinking and teaching of Dr Leaf is shown up as shallow and inadequate. Her little quote of the day doesn’t prove that free will is Biblically and scientifically supported, far from it. All it shows is that Dr Leaf’s views are narrow and blinkered, and aren’t reflective of any scientific or scriptural expertise. Dr Leaf is welcome to her opinion, but until she gains some actual expertise, she should reconsider her choice to share it. Haggard P. Human volition: towards a neuroscience of will. Nature reviews Neuroscience 2008 Dec;9(4):934-46. Libet B, Gleason CA, Wright EW, Pearl DK. Time of conscious intention to act in relation to onset of cerebral activity (readiness-potential). The unconscious initiation of a freely voluntary act. Brain : a journal of neurology 1983 Sep;26 (Pt 3):623-42. Soon CS, Brass M, Heinze HJ, Haynes JD. Unconscious determinants of free decisions in the human brain. Nature neuroscience 2008 May;3(5):543-5. Bonn GB. Re-conceptualizing free will for the 21st century: acting independently with a limited role for consciousness. Frontiers in psychology 205;4:920. Horga G, Maia TV. Conscious and unconscious processes in cognitive control: a theoretical perspective and a novel empirical approach. Frontiers in human neuroscience 204;6:199. This entry was posted in Biological, Caroline Leaf, Psychological and tagged action, Alien Hand Syndrome, capacity, caroline leaf, choice, cognitive neuroscientist, criticism, false teacher, free will, intention, Keith Ward, Libet, moral, neurobiology, right, wrong by cedwardpitt. Bookmark the permalink.